Here's my third serious attempt at Astrophotography. OK, I'll stop numbering them now. This one shows Cassiopeia, the small-ish W in the northern sky, and the central part of Andromeda, which includes the galaxy M31. North is to the left. 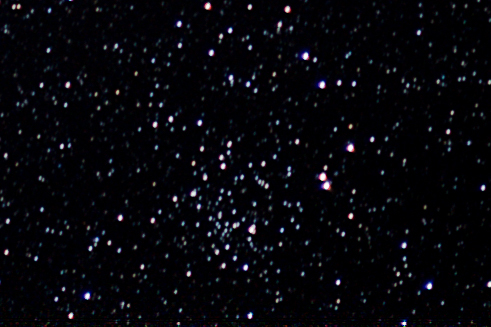 The image formed from 40 exposures of 30 seconds each is shown below. Cassiopeia is one of my favorite constellations because it's the constellation I observed from my Madison Heights back yard on the first night I used my 8-inch telescope in October of 1984. As this was all new to me at that time, I was pretty unsure about the precise spots in the sky where the objects were located, and unsure of what I should expect them to look like, so I spent the first month or two with that telescope concentrating on this constellation, reviewing it again and again until my confidence in what I was seeing grew. The marked-up copy of this photo is shown below. 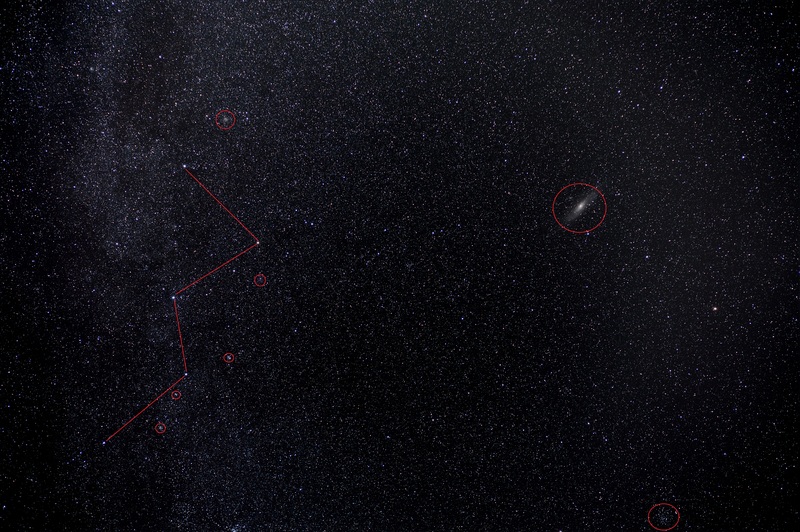 The W of Cassiopeia is drawn-in as lines, and there are 7 circled objects, which we'll address from top to bottom. Moving over to the right side of the photo, the next object from the top is the Great Andromeda Galaxy, or M31. Earlier during this night, and a couple nights ago, I took photos specifically of this galaxy using a higher-magnification lens. The one from a couple days ago turned out the best, so I'll just refer to that blog posting for my best shot of M31 and its description. 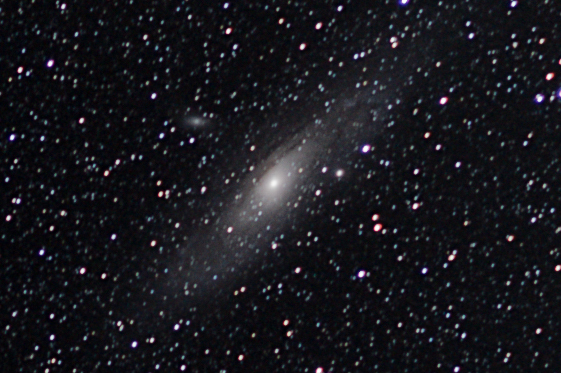 But below is the not-too-shabby enlargement of M31 in this photo of Cassiopeia and Andromeda. The third circle from the top surrounds the gaseous nebula NGC 281, prosaicly known as the PacMan Nebula. This is a region of star formation, where the interstellar gas supply has condensed enough to ignite stars, and the light from those stars makes the remaining gas glow pinkish-red. It barely registers on this photograph. Visually, I couldn't see this at all from Madison Heights, I could barely see a glow from Shelby Township (probably similar to this photograph), and during 2005 from Casco Township I could make out the nebula relatively easily. It's about a 25-arcminute glow, with a pie-wedge bite taken out of it, resulting in the PacMan name. I also noted it to be shaped like a comma rather than a PacMan. Fifth from the top is Messier 103 (M103), which I remember looking for without luck on that first night with my 8-inch telescope. I think I was expecting something brighter, larger, and splashier, so I probably rejected the actual cluster out-of-hand. 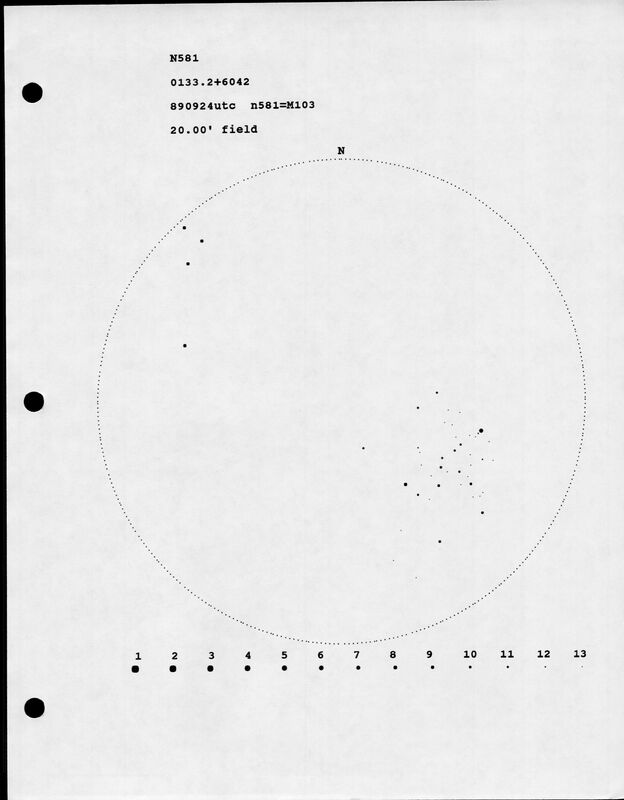 But by November and December of 1984 I was confident I'd found the cluster, and I sketched it in September of 1989 from Shelby Township. 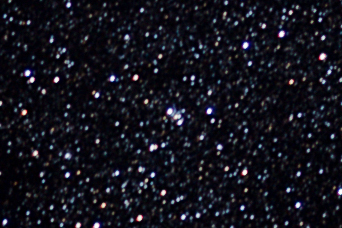 The central (brightest) star of the cluster is a red giant, and a dipper-shaped grouping of stars is in the same telescopic field of view. 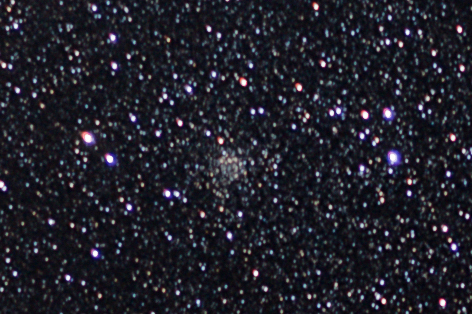 I counted 40 stars in this cluster from Casco Township in October of 2005. 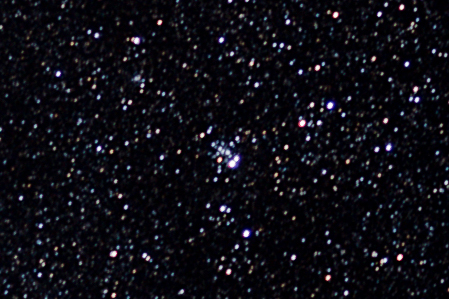 Sixth from the top is the open cluster NGC 663, one of the objects I saw on my first night with my 8-inch scope in Madison Heights. I couldn't identify it with anything on my charts, but I thought it was a bright splashy group so wrote it down in my notes. 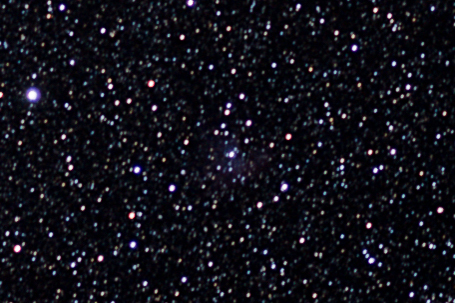 Over the next couple of months I identified it as NGC 663. It's a football-shaped group of about 30 stars with 3 double-stars within it. I sketched it from Shelby Township in September of 1989. 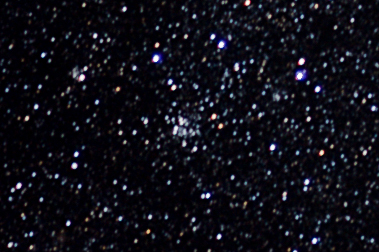 Seventh from the top is the open cluster NGC 752. 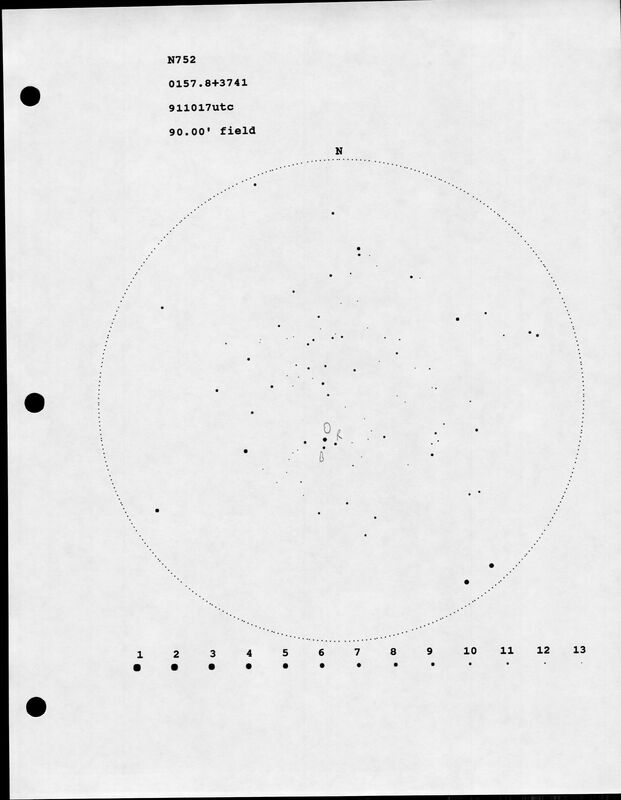 Apparently by November of 1984 I'd ventured beyond Cassiopeia and found this very large and obvious cluster of 75 stars. 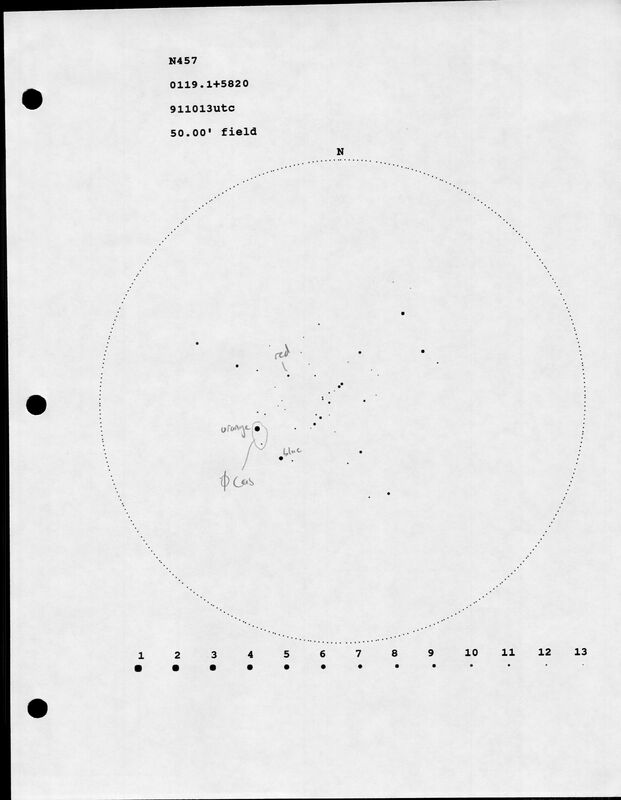 My sketch from Shelby Township in October of 1991 labels the orange, blue and red stars near the center of the cluster. 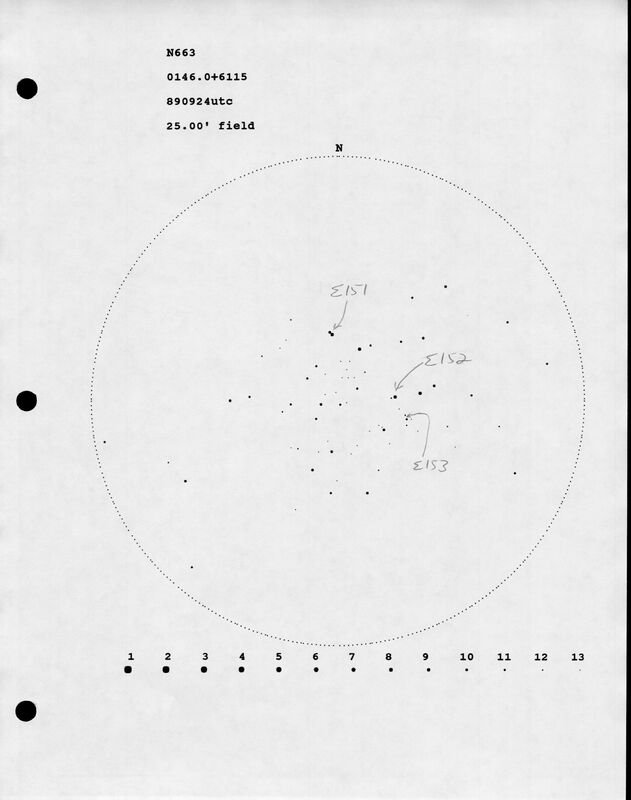 In August of 1995 I was able to see a glow in this area with a few resolved stars with 7x50 binoculars from the Porcupine Mountain State Park of the Upper Peninsula of Michigan.